GEO ExPro - Croatia’s 2016 Licence Round. A second bite at the Big Apple. Croatia’s 2016 Licence Round. A second bite at the Big Apple. Multi-Client seismic coverage offshore Croatia. Croatia’s first licence round ran through 2014 with an expectation of highly competitive high work-commitment bids and with the world oil price at over $100 bo. Multiple strongly competitive bids were indeed submitted by IOCs for over 15 of the blocks on offer; however, with the disruption and uncertainty in 2015 caused by the unexpected collapse of the world oil price, it is perhaps no surprise that most of the offered low-hanging fruit remains on the tree. Yet Croatia’s oil and gas licensing authority (AZU) is coming out fighting, with a plan to open a new licence round in Q1 2016 offering 13 offshore and 6 onshore blocks, with expectations that recognise the realities of exploration business today, and opportunities to deliver extraordinary value from oil in shallow water, located at the heart of Europe. It is time for a second bite at this apple. The Adriatic Basin is a prolific hydrocarbon province with a number of producing gas fields in both Croatian and Italian Adriatic waters. Chasing oil plays on the Croatian margin has been hampered by the imaging of the legacy seismic data, preventing accurate prospect and source rock distribution identification. 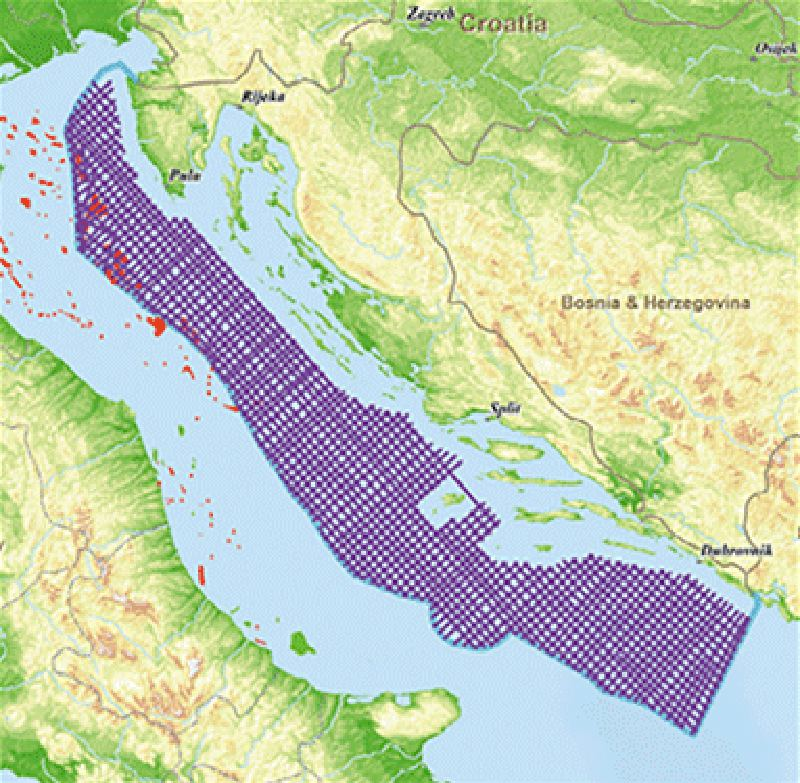 High quality seismic data acquired in 2013 has allowed Spectrum to evaluate the petroleum prospectivity offshore Croatia by combining seismic with well and potential field data. This evaluation has led to a number of breakthroughs in the understanding of the petroleum system of the Adriatic Basin. Insights into the spatial distribution maturation history of the Upper Triassic source rock, and the variability and distribution of Mesozoic carbonate platform margins that provide the primary prospective reservoirs allow the calibration and assessment of risk factors for these elements of the hydrocarbon system. Additionally, they have been used to make potential resource estimates of the numerous leads identified in the open acreage. Upper Triassic maturity maps The proven oil source rock in the Croatian Adriatic is the Upper Triassic ‘Burano Formation’ equivalent encountered by the Vlasta-1 well in 1986. Recent retrospective studies of core and cuttings from this well by INA have demonstrated the presence of black organic-rich carbonates with type II Kerogen of algal origin. These sediments were deposited in restricted sabkha ‘intertidal’ environments in synrift grabens formed during the breakup of Gondwana. Such syn-rift restricted grabens also provided the salt-reflux basins depositing thick Triassic salt that have subsequently controlled the depositional environments of the ensuing Mesozoic sequences. The Triassic source rock at the base of the Mesozoic carbonate platforms was rarely visible on legacy data. However, the long streamer and record length of the 2013 data allows imaging of a deep intra-Triassic reflector that represents the source rock level and therefore allows estimation of the burial history of the Late Triassic source rock. After mapping the intra-Triassic, top Jurassic, Early Cretaceous, Late Cretaceous, Eocene and Oligocene reflectors, time grids were used with well data and stacking velocities to create a set of depth grids that were combined with well data heatflow maps as input into a basin modelling study. Focussed on the Triassic source rock, hydrocarbon generation and migration have been modelled across the Croatian margin, correlating migration to the timing of trap formation in each of the basins offshore Croatia. The idea that the Triassic source rock generated oil throughout the Tertiary until the present day is also supported by surface oil seeps from optical satellite data. Well data, seep study and seismic data suggest hydrocarbons offshore central and southern Croatia are from the Triassic source and are thermogenic not biogenic. This is in contrast to the northern section of Croatia where the hydrocarbons are post-Cretaceous and biogenic in origin. Back-stepping Mesozoic carbonate platform, central Croatian Adriatic. It has long been understood that the Adriatic Basin is dominated by a thick succession of shallow to deepwater carbonates deposited through Mesozoic to Palaeogene times. These sequences provide the main hydrocarbon reservoirs and are overlain by Cenozoic clastics providing competent mudstone topseal. 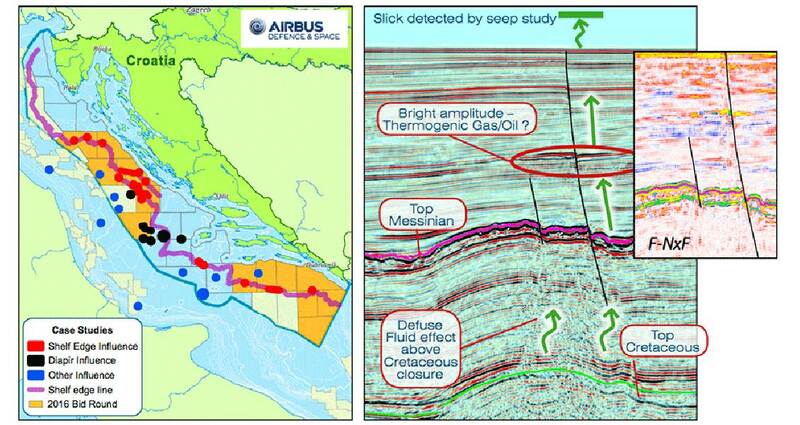 During the evaluation of the 2013 seismic, tying in all available well data and focussing on the mapping of seismic character of platform and distal facies, it became clear that the carbonate margin on the Croatian side exhibits different behaviour to the aggradational margins of the Italian Adriatic. 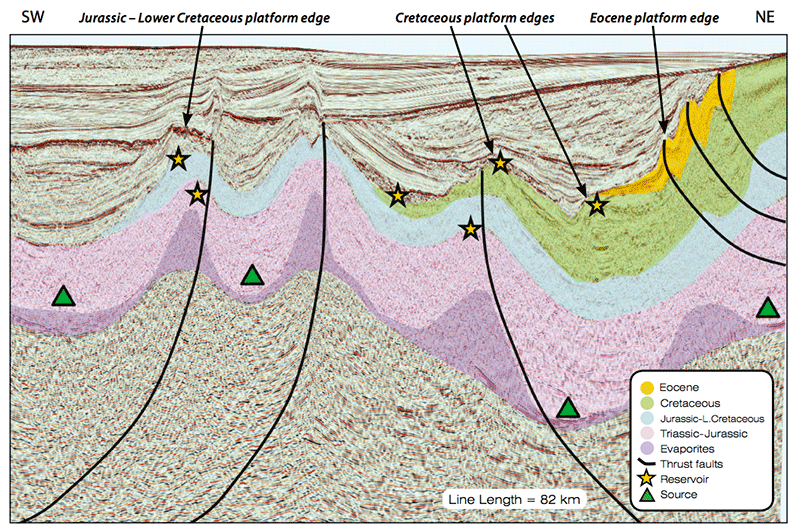 In the Central Croatian basin, multiple eastward stepping carbonate platform edges are identified, providing a range of potential high porosity targets. This previously unrecognised back-stepping platform in the Croatian Adriatic is probably a result of a halokinetically driven platform instability and intra-salt wall pod formation and subsidence. Anticlines: A number of large closures have been created by differential subsidence over geostationary or inverting mobile salt walls and diapirs. These structures have been intensified and rejuvenated by Dinaric inversion during the formation of the Oligocene foredeep of the eastern Croatian offshore area. Inversion tectonics in a north-west to southeast orientation combine with reservoirs in the Cretaceous shallow to deepwater carbonates, and Eocene to Miocene carbonates and siliciclastics. Stratigraphic: Several Cretaceous–Pliocene play types can be identified on the seismic data as carbonate slumps or debris flows as well as silicilastic/carbonate fan turbidites emanating from the shelf and reworked anticlines. Some of these exhibit high amplitude seismic signatures that could indicate hydrocarbons. A potentially exciting play, unexplored in the northern Adriatic, is the ‘Messinian clastic play’, a sandstone deposited on the Messinian unconformity during the post-Messinian transgression. This provides the reservoir for the adjacent Patos Mirenza Field in Albania, one of the largest onshore oil fields in Europe. Platform Carbonates: There are numerous structurally closed buried carbonate platforms or platform margins which are expected to have enhanced porosity due to fracturing, dolomitisation and karstification. These are seen in the Jurassic through to Eocene. Basinal Carbonates: In several places along the margin, tight structuring from salt or westward vergent thrusting has generated fairways of significant prospectivity with reservoirs that are likely to be in the distal or deep basin carbonate setting. Whilst some remobilised materials in a talus or turbidite setting may provide reservoir, the key element to success is likely to be fracture density and connectivity. Pre-Salt Structures: There are a large number of PermoTriassic and Jurassic shallow marine sandy limestones in tilted fault blocks and horsts. The reservoir is expected to have porosity of 5–10% as recorded in similar depth wells. Unrisked resource potential is estimated for these play types and presented on the tables below as largest or average-sized examples as well as estimated cumulative numbers for each category. Indicative potential lead recoverable (un-risked) resource estimates and total potential by play type. Croatia is set to launch its second licence round in Q1 2016. With the availability of modern seismic we can image and model the Triassic source and identify over 200 leads with potentially stunning potential. The Croatian offshore could be Europe’s next large oil province in the very near future. The exploration world has changed since the first round left the prize fruit uneaten – now is the time to have a second bite at the apple. Wrigley, R., Hodgson, N., and Esestime, P., 2015. Hydrocarbon potential of the Adriatic Basin, offshore Croatia. TGS’ processing of Baffin Bay 2D seismic data employs innovative techniques already proven in the Atlantic Margin and has enabled TGS to launch a 31,000 km reprocessing initiative. The reprocessed data will provide a tool to enable interpreters to produce meaningful correlation in these frontier basins.